Our third Far North pelagic (I wont call it “Three Kings pelagic” since we didn’t actually get to the Kings this time!) ran from 4th to 7th April. Aboard the good ship Demelza were Tank Barker (skipper), Steve Wood, Tim and Matt Barnard, Sioux Plowman, Iain Johnson, Brent and myself (organisers!?). The trip really started the night before when we were treated to great views of the Kaitaia BARN OWLS. Many thanks to Kevin Matthews for giving up his Friday evening to show us “his” birds. We left Houhora at 0730 on Sat 4th and headed North. The forecast was not good for getting to the Three Kings, so we decided to go to deep water just north of North Cape and then track back in towards Cape Rienga. We actually had no real problems with weather throughout the trip – mostly fine and sunny with choppy, but not rough, seas and an easterly breeze (Brent was sick of course but no-one else!). The first morning brought many of the common northern species – more or less constant flesh-footed and Buller’s shearwaters, flutterers inshore, lots of diving petrels – and a few surprises. A brown skua flew by, as did a single Cook’s petrel, and a white-faced storm-petrel. Best bird was a cracking pale phase SOUTH POLAR SKUA. The afternoon was similar, with a couple of little shearwaters and 4 sps of Albatross making up the numbers. We were beginning to realise that the cooler weather of the previous week or so, coupled with easterly winds, had changed the bird population from our previous 2 trips – there was to be a distinct lack of pterodroma petrels through the trip (all the expected species were seen, but numbers were way down). As the afternoon was drawing to a close we were just off Cape Maria van Diemen when a smallish dark bird was spotted just ahead of the boat – it turned out to be a BLACK (WHITE-CAPPED) NODDY which gave the most fantastic prolonged views much to the delight of all on board. I have had a quick look through the recent rare bird reports, and HANZAB, and I think this may be the first off mainland NZ since 1990. Photos can be seen here. We spent the night moored nearby (Crayfish, Kingfish and Snapper made for a decent dinner!) and the bird was still present next morning as we set off towards the North again. Although the weather was quite good enough to make it to the Kings, reports from Marlin fishermen were that the sea was very cold up there with consequently little fish activity, so we thought that we had better go where the fish- and therefore the birds?- were, and headed to a point almost due North of North Cape. The majority of the day was spent drifting and burleying up there and we attracted quite a reasonable array of birds. The star bird that day was surely WHITE-NAPED PETREL (though only 2 birds were seen) backed up by grey ternlets and Wilson’s storm-petrel, and about 15 wandering albatross, including 3 presumed Antipodeans, and a ridiculously white presumed Gibson’s (none of us had seen such a white bird before, and we think it was too small to be a Snowy). Two reef herons were in Tom Bowling’s Bay where we spent the second night. Day 3 saw us back in a similar position and a 5 hour burley session which was the most productive period of the trip. 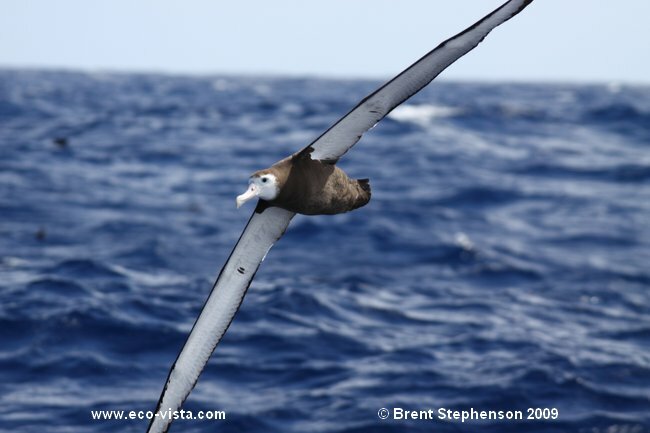 The only KERMADEC PETREL of the trip flew past only half a mile outside the 12 mile limit for counting on the “mainland” list, and we found the biggest concentration of pterodromas and stormies. Several grey-faced and black-winged petrels were here, along with Cook’s, a second SOUTH POLAR SKUA (a different individual) put in an appearance, and the place was littered with Wilson’s storm-petrels. It was hard to judge how many birds were seen, but there were often 5 – 7 individuals in view, and I imagine that we may have seen 30+ altogether. We were all very happy to add NEW ZEALAND STORM-PETREL to our list, and we had 4 sightings of this brilliant little bird, quite likely 4 different individuals. Photos showed there to be certainly 3 different birds – one of which had the darkest breast markings that any of us had seen. 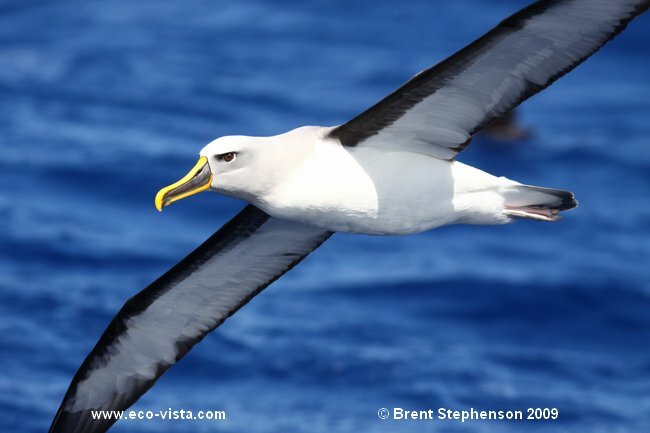 The fourth day was its customary anti-climax with little new added except a pristineNorthern Royal albatross and another WHITE-NAPED PETREL. Back on dry land we had COMMON TERN and WHITE-WINGED BLACK TERN at Unahi. 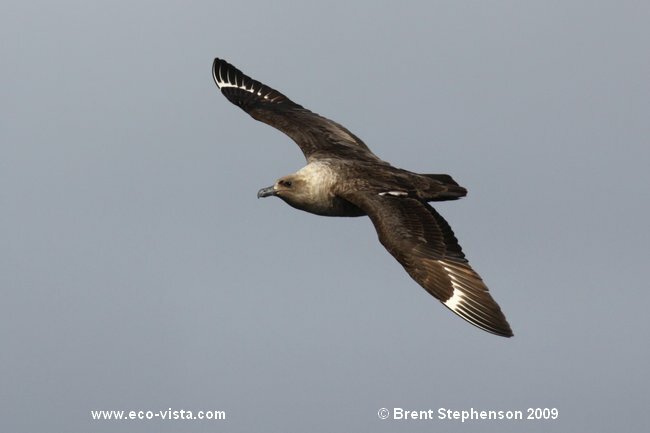 All in all the species diversity was good – 30 pelagic sps compared to 29 on each of the previous 2 trips, the Black (white-capped) noddy was a bit of a mega-bird, and the only disappointment was the scarcity ofblack-winged, grey-faced, and white-naped petrels. We also saw, caught and eat some very cool fish, saw pilot whale and common dolphin and a marlin. Next year we shall probably try to go a couple of weeks earlier. If you are at all interested, please register that interest with me asap – there are only 7 spaces on board (well, only 5 really since Brent and I shall be taking 2 of them! ).